we want to start making soap from goat milk. looking for a kit that includes everything that you need to make the soap. equipment as well as what you have listed on your site. do you know where we can find this? we would like to able to product as much as 100 bars. Can you please tell me the superfat if any in this recipe? We used a %5 superfat. Is this general recipe safe for dogs? This is a question that would best be answered by your pet’s veterinarian, we don’t have much expertise for animal soaps. I did not buy the kit, but used this recipe for my first try at making soap. I did not use fragrance. Will that make a difference in the recipe? That won’t make a big difference in the recipe except you will have unscented soap. 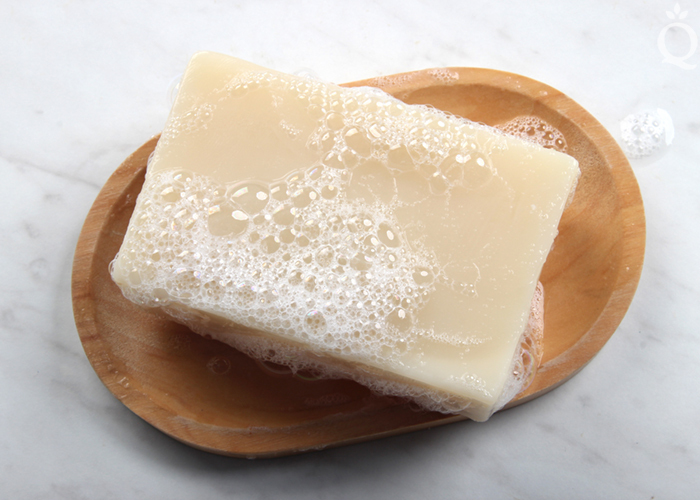 Some people prefer unscented soaps, especially if they have sensitive skin. Can you tell me if this would be all vegan? Since non of the ingredients are animal based, the product would be considered Vegan. could this recipe be used as a melt and pour as well? Can I add color and exfoliat to this recipe? If so how much? Yes, you can add both. For color, pigments and micas work well. Mix 1 teaspoon of the color with 1 tablespoon of a lightweight liquid oil like sweet almond. Add 1 dispersed teaspoon at a time at trace until you get a color you like. For exfoliants, start with 1 teaspoon per pound of soap at trace and go from there. This recipe creates firm bars and the castor and coconut oil give it a good amount of lather. It will also work for a swirl or spoon plop. Just blend to a thin trace so you have time to work with the design. Hiya, i’m very new to soap making and I don’t want to use palm oil. What would be the best substitute for it? Can I use any other essential oil in this recipe? and if it’s EO, should I still use it in the same quantity? Can I use Rosemary EO in this recipe? Una consulta,tengo unos lotes de jabon que ya estan curados pero no me gustan unos porque el color es muy fuerte y otros porque no huelen muy bien,se pueden rallar y agregar a la mezcla de un jabon nuevo,quizas en la traza? perdon quize decir si se pueden rallar los jabones curados y agregar en la formula de un nuevo jabon? You can do this. You could grate up the bars and introduce them to cold process soap batter. This is sometimes referred to as “confetti soap,” because the soap pieces look like confetti once the soap is cut into bars. We did this in the tutorial below. Another technique would be grating the soap, and melting it down over low heat along with some distilled water. This is called rebatching soap. 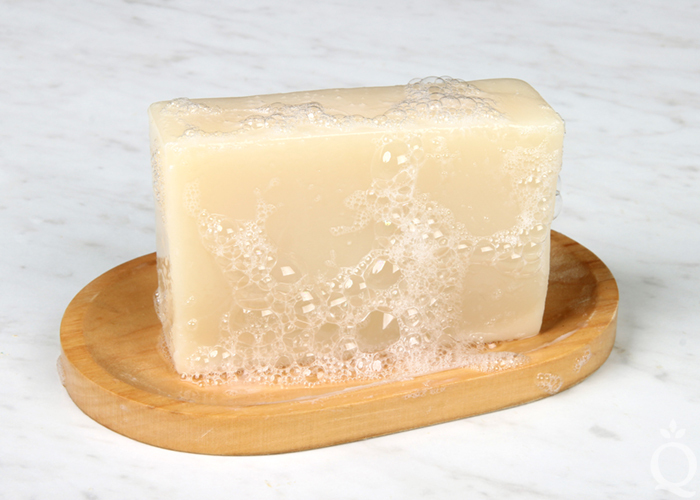 This works best with soap that is fresh (not fully cured), but it can still be done with cured soap as well. 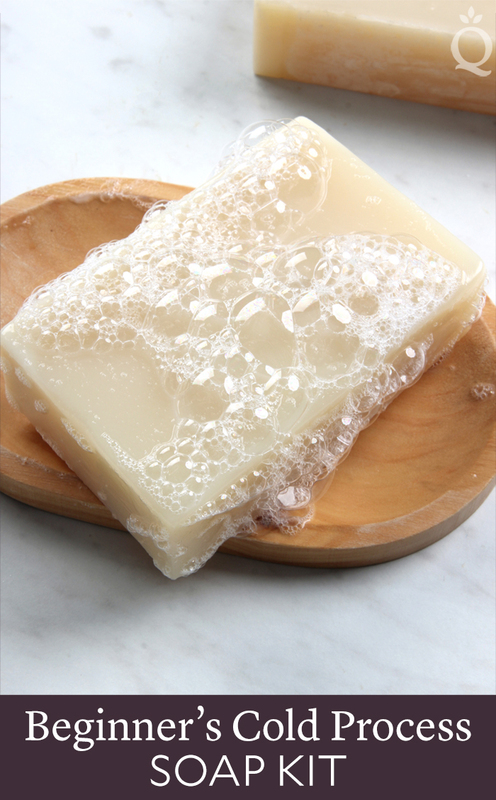 We show how to rebatch soap in the video below. Hello, should I put a towel over the soap while I’m waiting the 2-3 days to take it out of the mold? If so what kind? Also what do you put the soap that’s curing in for the 4-6 weeks? Meaning a container with the lid off or on a plate? Hello and thank you for all these wonderful tutorials! I am a total beginner. I have dedicated the holidays to teaching myself soap making… but I’m having a hard start. I have made 4 batches so far and all of them have been somewhere on the scale between “Total Disaster” and “Is this Soap?” 😀 I think I’m having lye issues, as I am having loads of troubles getting it to dissolve in water and I need to dilute to something around 25% or less concentration just to get it full dissolved but them I’m ending up with SUPER oily/fatty batches that take hours to trace (with a stick blender)… Is there a place on here where I could post or send images with more details of my process etc? I would HUGELY appreciate any and all help! Thank you in advance. Thank you so much. Email sent! You can, that will look nice. Powder pigments work well in cold process soap. To use them, mix 1 teaspoon of the colorant into 1 tablespoon of a lightweight liquid oil like sweet almond. Then, add 1 dispersed teaspoon of color at a time at trace until you get a shade you like. If i want my soap to have a natural green color like that of a aloe vera leaf. What powdered pigment would you recommend? Mix 1 teaspoon of the color with 1 tablespoon of a lightweight liquid oil like sweet almond. Add 1 dispersed teaspoon at a time at trace until you get a color you like. I am having a very weird issue. Some pieces of soap have gotten moulding on the surface. Now these pieces are almost a year old. I had gifted some to a friend and I still have others of the same batch. Its interesting that I had gifted her 7 soaps yet only 3-4 have gotten moulding on them. The others that are there with her havent got any other form of moulding. Even the other pieces that I have havent got any moulding. Its just those 3-4 pieces. Any idea as to what couldve happened? Soap has a pH level that doesn’t allow mold to grow. However, if there are fresh items on top like flowers or orange peels, they can mold. Are there any fresh items on top of the bars? Or are there orange spots? 1-milk should be pasteurized right? I have frozen cubes of pasteurized milk for about 15 days or more do you think I can still use them? 2- when I put the recipe in soapcalc.net I have to insert the water option and option 1 ( water as % of oils) is automatically set at: 38. do you recommend changing and using option 3 (water: lye) ratio? Without the shea and palm, you can increase the coconut oil to 33% and the rest can be covered with olive oil. Both palm and shea help harden the bars, so without them the recipe will be pretty soft. You may need to wait a week or more before unmolding. By the way, I didn’t find these options in your calculator. For a beginner it is sometimes helpful to have them because it is somehow complicated to just figure the values manually. By the liquid amount you also mean: water as % of oils? Forgive my elementary questions: So when you post a recipe with percentages you already have that liquid amount counted for?What happens then when your recipe percentages are inserted in another calculator in which there is the value I told you about: (water as % of oils= 38)? I have to insert something there. Yes, that is water as the percentage of oils. I’m not sure how to work with the other calculator so I would recommend contacting them to learn more. Thank you very much for your great posts, I have a general problem in soap making. I decrease temperature of my lye solution around 35-40 degrees Celsius. I also decrease temperature of my oil part (coconut oil, pomace and castor oil) to 40 degrees Celsius and pour lye to oil part. However as soon as I pour them the soap batter gets thickened. It gets like a putty. What am I doing wrong ? (I use a stick blender to mix them). It gets to thick that I cannot even pour into molds. It gets there like in 20-30 seconds. Try increasing your lye and oils to 45C. At that temperature they should stay melted and give you more time to work. Thank you Kelsey! I am new to this so before I got your reply I had made some:around 48% olive, 36% coconut and 14% castor. Calculator gave 37 for the hardness and lodine: 58 so not sure how hard the bars would be. I love the hardness in the picture above. What if I don’t have a substitute for Palm oil? Did you mean that if I take the palm oil off without adding a substitute, (coz I can’t find coconut butter) then I can decrease olive oil by 15%? You can leave the palm oil out completely and increase the coconut oil and add the cocoa butter. Palm oil adds hardness to the bars, so without it they will be softer. Adding hard oils like coconut and cocoa butter helps harden the bars. Thank you! How about Shea Butter instead of Palm oil? I don’t have access to cocoa butter or babassu. I also would love to see beginner body wash/body shampoo recipes, could not find any Here. Thank you so much! You can use shea butter but we only recommend it up to 15%. You can replace some of the olive oil with shea. I would also recommend reducing the castor oil to 2-5%. More than 5% can make the bars fairly soft and sticky. I mean can I use a soap by melting the bar to make body wash/body shampoo? Or are you saying that the base SHOULD be liquid soap instead? If you make a solid bar, it will stay solid at room temperature. If you want a liquid base, you’ll need to start with potassium hydroxide and use the method linked above. Thank you very much for posting this recipe. Can I use the same recipe , take off the palm oil, and make it HOT PROCESS soap so that I can start to use the soap faster?anything would change? I would use smaller amounts of oils. You can leave out the palm oil if you like. I would recommend increasing the coconut oil to 33% and adding in another hard oil like cocoa butter up to 15% (you can add 15% less olive oil). That will help make the bars firmer.